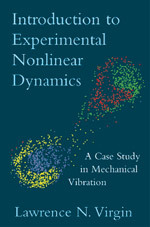 Welcome to the homepage of Prof. Lawrie Virgin's Nonlinear Dynamics Research Group. The lab is within the Department of Mechanical Engineering at Duke University in North Carolina. In these pages you will find sample descriptions of the research conducted in the lab. Search through the tabs to find information on past and current research projects as well as information on past and current team members and collaborators. A good deal of the research has an experimental component to it, and many of the applications are associated with problems from the field of aerospace engineering. 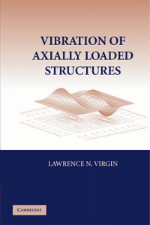 The research encompasses a variety of projects most of which have elements of buckling and vibration. A useful database of experimental videos with brief descriptions can be found in the video tab, and further technical details can then be found in the associated journal publications. A more detailed description of the book on the left can be found simply by clicking on the image.